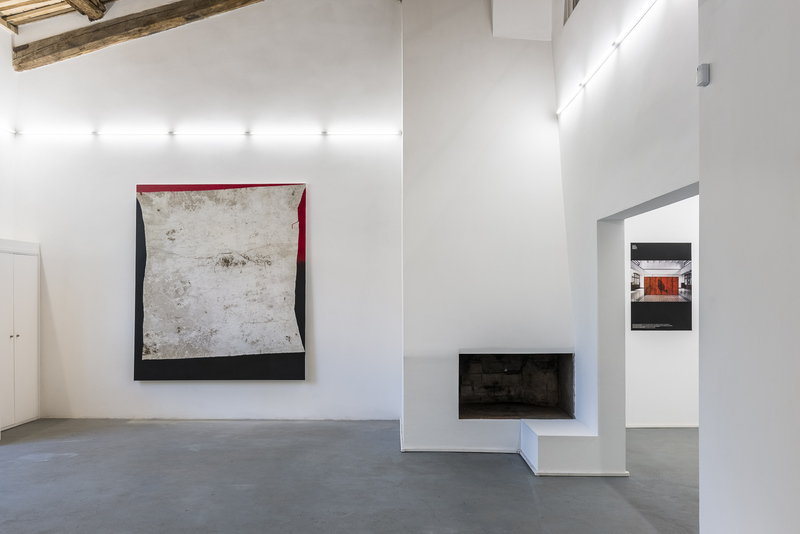 Opening reception on Tuesday, October 11 from 6:00 to 10:00 p.m.
AlbumArte presents the double personal exhibition of the artists Flavio Favelli and Gianni Politi entitled Residenze #1, curated by Paola Ugolini. 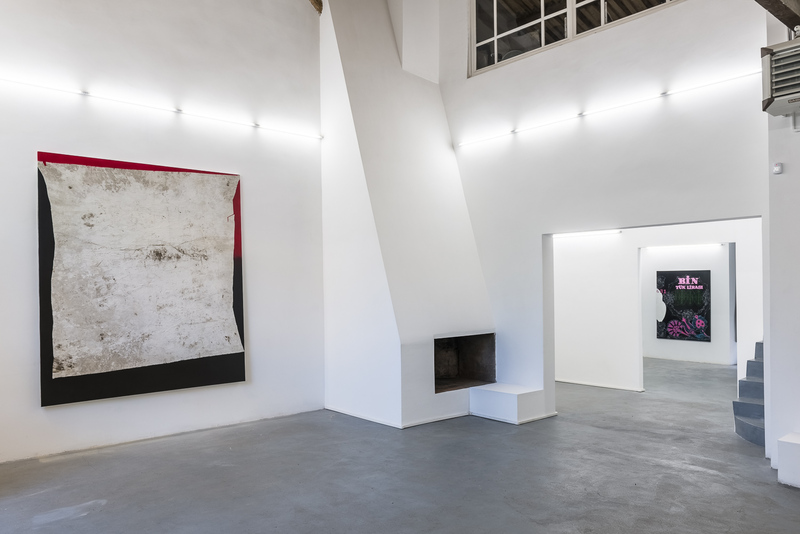 The show, curated by Paola Ugolini, will inaugurate the cycle Residenze, a project by Cristina Cobianchi, through which AlbumArte aims to reflect around the theme of artist residency, using the exhibition spaces on Via Flaminia to expose artworks exclusively produced during artist-in-residence programs conducted abroad and which will be exposed in Italy for the first time. The exhibition Residenze #1 will show the works that Flavio Favelli and Gianni Politi realized during their artist residencies abroad, both organized by AlbumArte in Istanbul and Prague respectively, highlighting how the practice of residency may deeply influence how the artist works – specifically, the way of working of a young artist and of a more experienced one – resulting in the creation of artworks which are quite distant from the artist’s style. 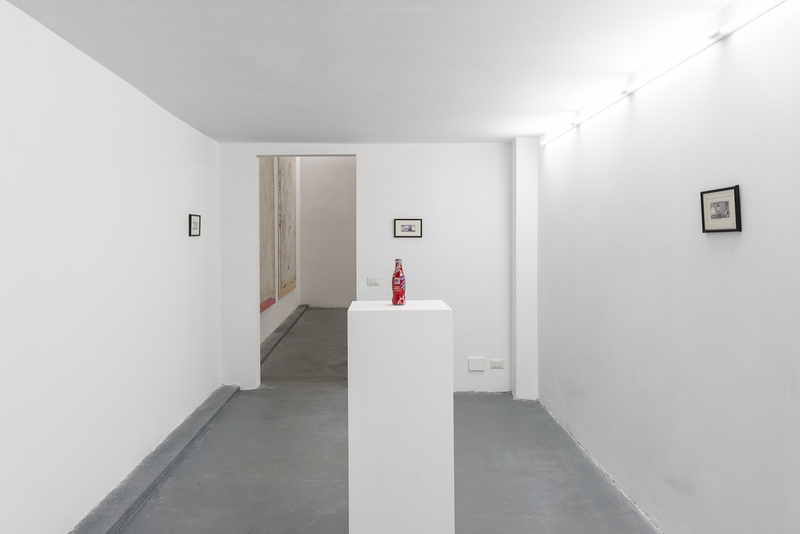 The two residencies, realized by AlbumArte in 2014 with the patronage of the Italian Embassy in Turkey, the Italian Institutes of Culture in Istanbul and Prague, the Yapı Kredi Cultural Activities Arts and Publishing and the Italian Chamber of Commerce in Turkey, were finalized with two personal exhibitions: Flavio Favelli ‘s Grape Juice, curated by Vittorio Urbani, at the Galata Rum Okulu (the Galata Greek School) in Istanbul and Gianni Politi’s giovane pittore romano, curated by Paola Ugolini, at the Italian Institute of Culture of Prague. 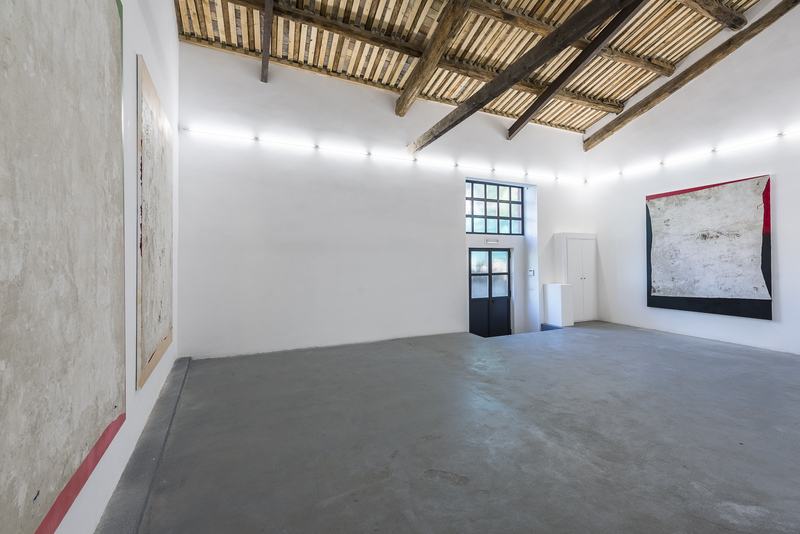 The works of both exhibitions now converge in AlbumArte’s spaces, exposed in Italy for the first time. 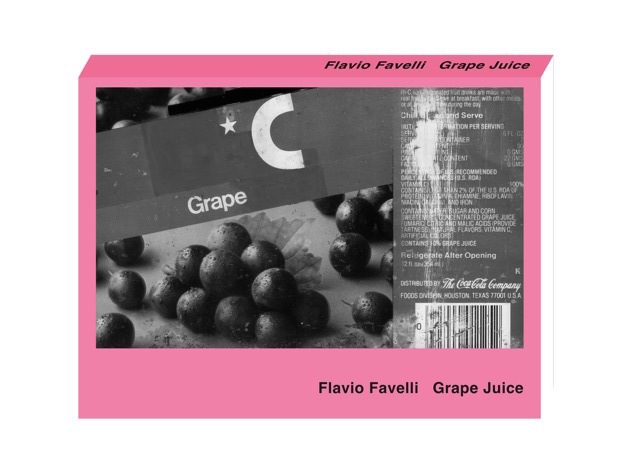 The book Flavio Favelli Grape Juice was launched in May 2015, published by Maretti. The book recounts Flavio Favelli’s experience of the artist-in-residence program produced by AlbumArte in Istanbul. Texts by: Cristina Cobianchi, Flavio Favelli, Cristiana Perrella, Vittorio Urbani. The book was launched at MAXXI Museum on June 18th, 2015. Being open to new and different experiences, traveling to discover new froms and new modes of practice, has always been part of the lives of artists. During the Renaissance, painters from the Northern Europe arrived in Italy to explore the harmony of proportions and a different way of making art that exceeded the beauty and boldness of the ancients. The Grand Tour, a trip through Continental Europe lasting from a few months up to several years, has been fundamental not only for the development of artists but also for the formation and education of a cultured and cosmopolitan middle class. 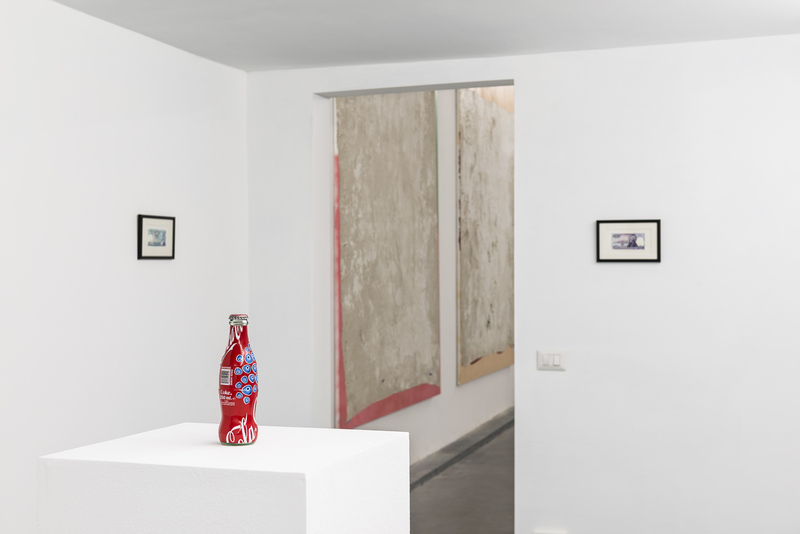 The practice of hosting artists in a specific place in order to support their research and creation of works starts arising considerably during the Sixities of the twentieth century. “It is in this moment that residencies conform according to two different kinds: on the one hand, the seclusion in a place in order to elude the traps and artifices of bourgeois society, focusing as sole objective the reflection on one’s individuality; on the other hand, the encounter with different realities to turn mutual understanding a means of rapprochement between art and community” (Matteo Innocenti on an article published on Artribune n.10). Artist Residencies are emerging for some years now as one of the most interesting, exciting and relevant phenomena in worldwide contemporary art; the prospect of spending a period of time of various lenght in contact with different visual and cultural stimuli located in a new context, offers an exceptional and beneficial opportunity not only for one’s intellectual growth but also, and mostly, it is an opportunity to learn how to confront and communicate with the other, the difference, the unknown. 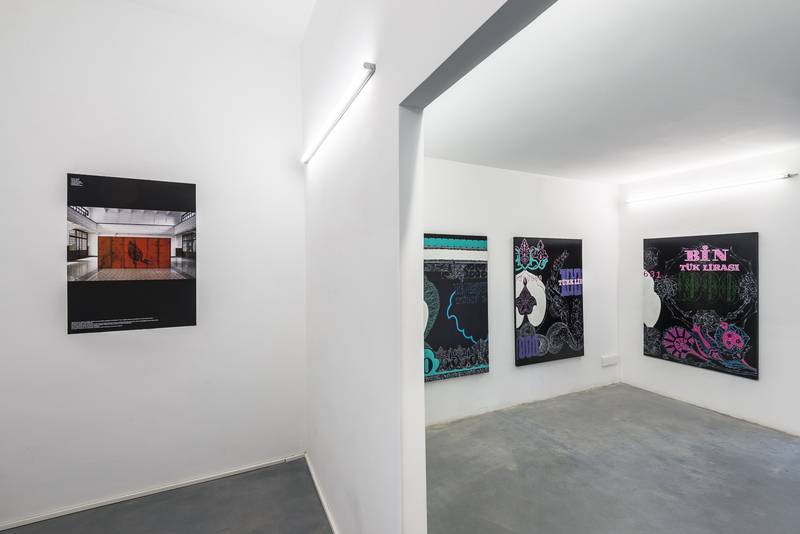 AlbumArte is an independent and non-profit association, a new vital reality, that during the last three years has carried out successfully the artist residencies of three italian artists, Flavio Favelli, Margherita Moscardini and Gianni Politi, in Istanbul and Prague; the exhibition in the spaces of AlbumArte is therefore an opportunity for the roman public to see the artworks by two of these artists, Favelli and Politi, both quite grounded in their urban realities, showing the very surprising results of their work realized in a different context from the comfort of their studio. Flavio Favelli (Bologna,1968) lives near the cemetry of Savigno, a small village in the Bologna’s countryside; his studio is found in a warehouse in the industrial area and the space is filled with icons of his childhood such as vintage clothes, Borsalino hats, old boxes, Martini bottles, Fabbri black cherries cans, chairs, windows and machines of various kinds. As an artist, Favelli constantly works on his personal history, rebuilding it through the creation of environments and objects that, thanks to their intrinsic power to evoke, turn the private and the personal into the collective. 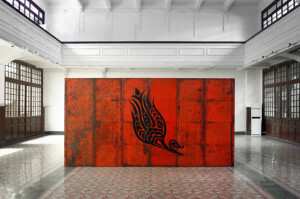 Althought not keen on leaving his creative boundaries, nor particularly fond of Istanbul, for six weeks Favelli was artist-in-residence at the Italian Embassy and exposed the resulting works in a personal exhibition entitled Grape Juice in the main hall at the Galata Rum Okulu (the Galata Greek School). 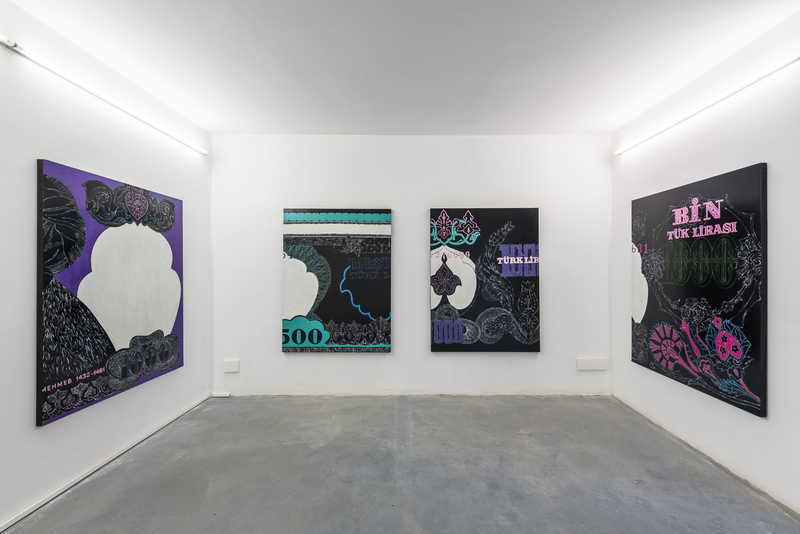 “The meaning of a show resulting from a residency” points it out the curator Vittorio Urbani “is in challenging the artist’s ability to respond to a new environment”. This ability also implies a certain degree of agility, given the short time available between the experience of feelings and the actual production of works. 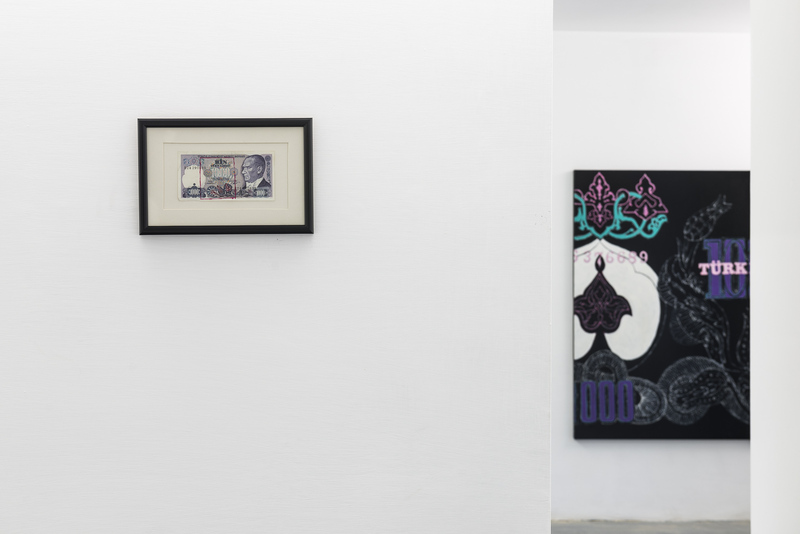 In Istanbul, Flavio Favelli reacted to a society that, since two centuries, is questioning its position regarding Modernity, and whose recent international “success” is now overshadowed by the most recent political and social situation. 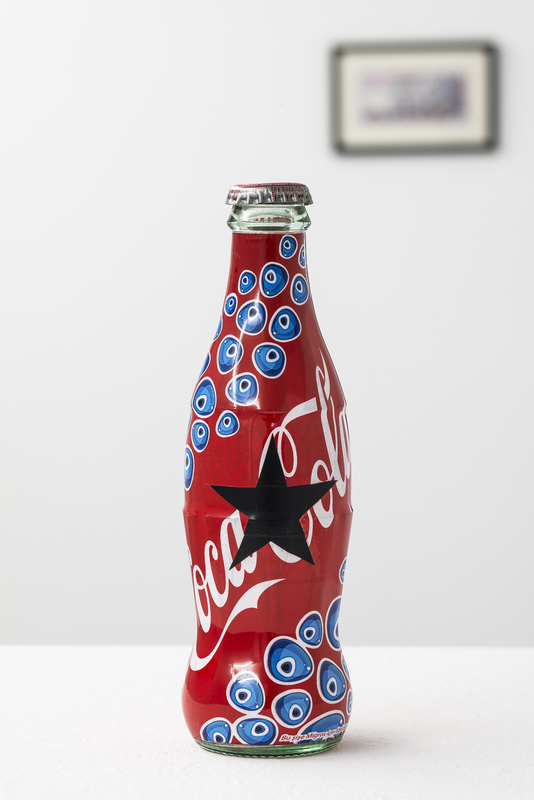 The enlarged details of Turkish banknotes from the 1970s become the decorative element of a series of four large panels painted with enamel, likewise a Coca-Cola bottle specifically manufactured in limited edition for sale in Turkey and found in Italy by the artist becomes the poignant symbol of a world stuck in between past and future. Gianni Politi (Rome, 1986) was instead confronted with a completely different reality, that of the charming baroque city of Prague. 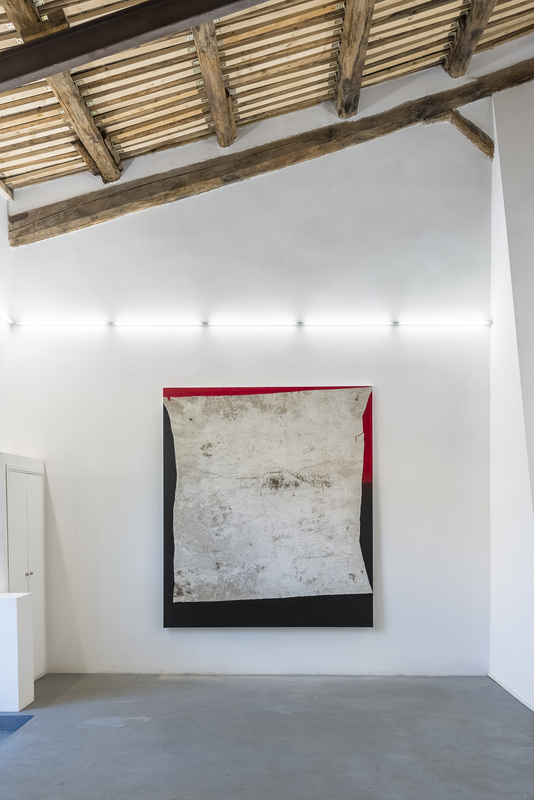 During a month of residency at the Italian Institute of Culture, he has produced works inspired by the seventeenth-century architectural monumentality of the city. 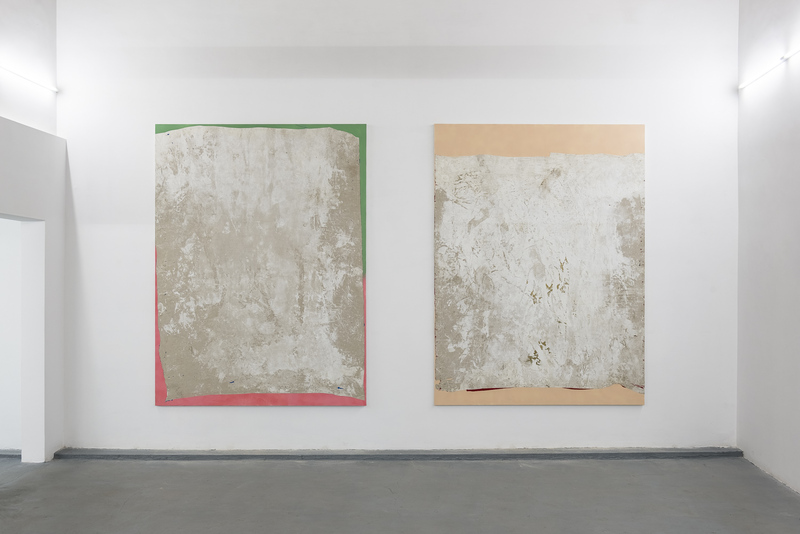 Politi has focused on the architecture of the Baroque Chapel’s forecourt, realizing three large textured canvases, featuring a dense and thick painting and delicate golden brushstrokes that highlight parts of the surface depending on the trajectory of the light, making the canvas moves in such way to look three-dimensional. Opening: Tuesday, October 11 2016 / 6:00 – 10:00 p.m.
« AlbumArte presents Monte Inferno | Opening and talk on Wednesday, September 14 2016 at 6 p.m.